Using patented punch and seal technology with liquid detection, the Oliso PRO Smart Vacuum Sealer is the best out-of-chamber vacuum sealer for sous vide cooking enthusiasts, providing professional level vacuum sealing. Not only does the Oliso PRO Smart Vacuum Sealer automatically seal dry food, it is the best way to vacuum seal liquids and marinades without the use of a large and costly chamber vacuum sealer. The Oliso vacuum sealer bags make vacuum sealing much quicker and easier, and the reusability makes them an economical food saver. Oliso PRO Smart Vacuum Sealer is professional level sealing that fits in a drawer. The Oliso PRO Smart Vacuum Sealer also works with accessories for wine storage and canning jars. Eliminate space-consuming storage bins and food packaging by preserving food with the Oliso PRO Smart Vacuum Sealer. 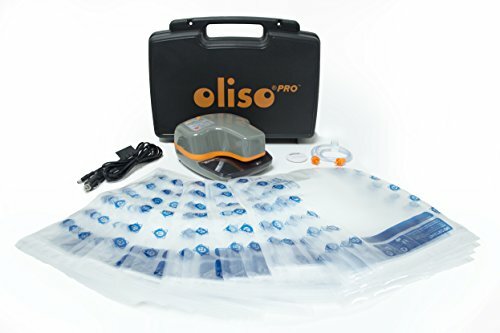 COMPACT, COMMERCIAL-POWER OUTDOOR VACUUM SEALER: The Oliso PRO Smart Outdoor Vacuum Sealer contains a Commercial-Power Dual Motor System for the Best Vacuum Sealer results. Its Revolutionary System uses Patented Dual-Seal Freshkeeper Technology to maximize the Freshness of your food. This Powerful Food Saver also features Automatic Start which allows you to easily slide the bag to the machine and it does the rest! DESIGNED FOR THE OUTDOORS AND TRAVEL: The Oliso PRO Smart Vacuum Sealer gets more air out of the bags than competitors, meaning your Food Stays Fresh Longer. The Stop and Seal setting allows you to stop the vacuum when sealing Fragile Foods. The Included 12V DC Adapter Connects the Vacuum Sealer through a 12 ft Cord for use in your Boat, Car, RV, etc. which makes this Outdoor Vacuum Sealer Perfect for Hunters, Fishing, and Camping. ECONOMICAL, REUSABLE EASY-TO-USE BAGS: Oliso Bags are extremely Easy and Fast to use. Simply put your food in, then use the Zip Disk to close the Air Tight Zipper. Once the item has been vacuum sealed, simply open the Resealable Zipper End to add or remove food, then close and reseal again! The Bags are BPA-free, Washable, and can be Reused 10+ times. In combination, the Oliso Vacuum Sealer and Oliso Bags are a great Money-Saving Tool that can save you Hundreds of Dollars a Year on groceries! WHY OLISO? It is Oliso's to Design Products that Simplify Everyday Life and Address Users' Needs. You can feel Confident purchasing Oliso Products: Each Oliso PRO Smart Outdoor Vacuum Sealer comes with a 3 Year Limited Warranty. If you have any questions about this product by Oliso, contact us by completing and submitting the form below. If you are looking for a specif part number, please include it with your message.